A scandal is brewing within the household of President Muhammadu Buhari. His wife, Aisha, has caused the arrest of her own Aide De Camp, after accusing him of defrauding her. The president’s wife is alleging that Sani Baba-Inna, a chief superintendent of police, received huge donations from politicians and business people on her behalf and then kept the cash to himself. Premium Times reports that Mrs Buhari therefore requested the Inspector General of Police, Ibrahim Idris, to arrest and compel Mr. Baba-Inna to refund the money, put at over N2.5billion. The police officer was arrested on Friday and has remained in detention ever since, with relatives having no access to him, family members say. It is unclear how the president’s wife came about the allegation, but one source said another aide working for Mrs Buhari originated the claim. An associate of the embattled police officer said Mr. Baba-Inna strongly denied the allegation, saying he received no donation from anyone on behalf of Aisha Buhari. Immediately the police received the petition from Mrs Buhari, the ADC was arrested on Friday last week and investigation launched. The police, it was gathered, concluded that Mrs Buhari must have been wrongly informed as there was nothing to show or prove that such huge sums of money was in the custody of Mr Baba-Inna. An associate of Mr. Baba-Inna said the police contacted those named as donors of the controversial funds but that they all denied making the donations attributed to them. When Mrs Buhari was informed of the outcome of police investigation, the source said the first lady flared up and accused the police of colluding “to protect one of their own”. She then reportedly asked the State Security Service (SSS) to take over the case and get her money back”. On the orders of the wife of the president, SSS operatives reportedly took custody of Mr Baba Inna. However, the spokesperson for the SSS, Peter Afunanya told Premium Times he was not aware of Mr Baba-Inna’s arrest by his agency. “You are just telling me now, I am not aware, but if there is anything like that I will get back to you,” he said. But Hassana, the wife of Mr Baba-Inna confirmed her husband’s arrest. She also said she “has not been able to speak with him since he was taken away”. 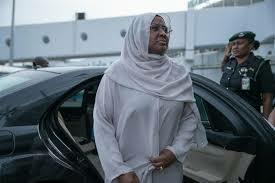 When contacted, the spokesperson of the wife of the president, Suleiman Haruna, said although he heard about the matter, he was trying to get details of the matter from Mrs Buhari, who he said is currently in New York with Mr. President.